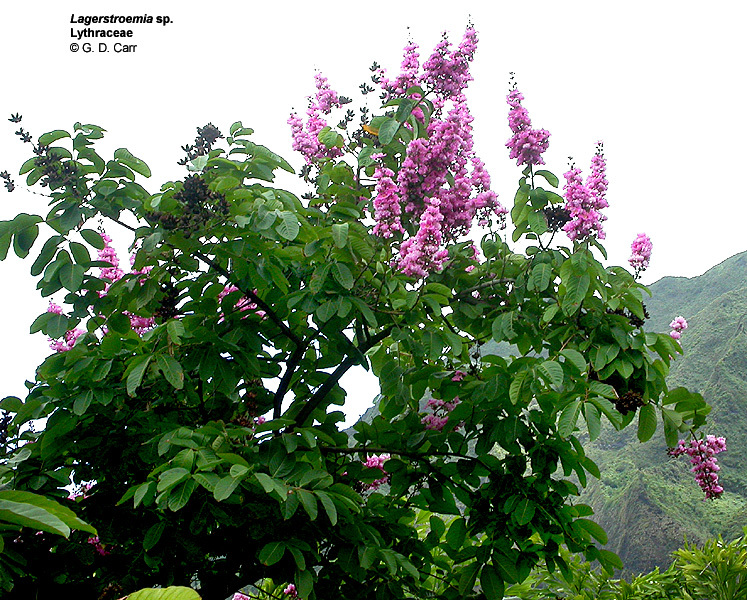 The Lythraceae are mostly tropical herbs or occasionally shrubs or trees comprising about 24 genera and 500 species. 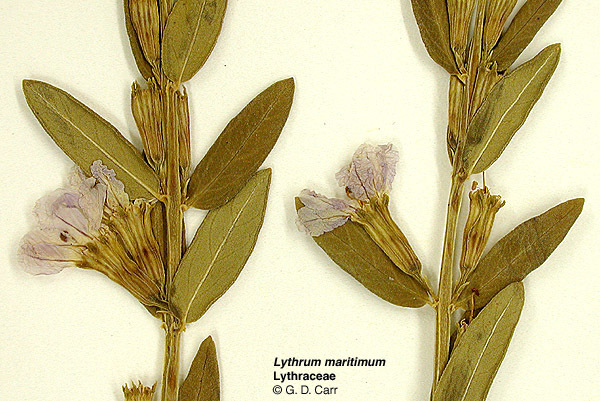 The leaves are simple, usually opposite or whorled; stipules are minute or absent. 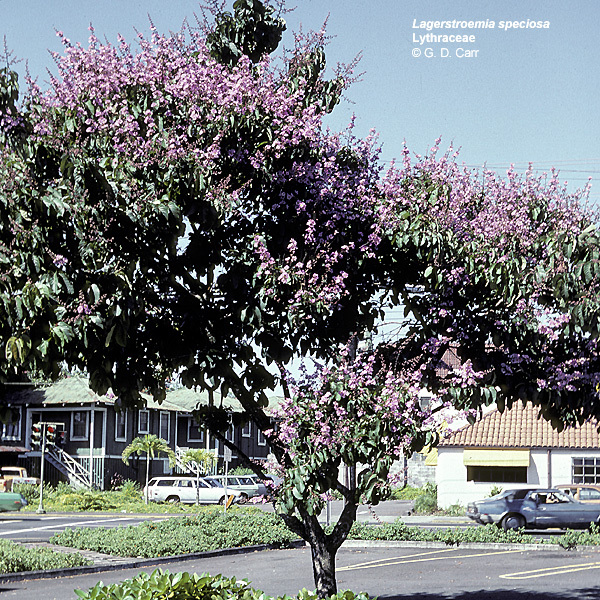 The flowers are strongly perigynous, actinomorphic or sometimes zygomorphic, commonly 4-,6-, or 8-merous. 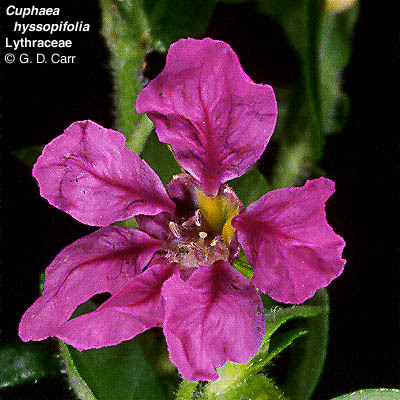 The sepals appear as lobes of the perigynous zone, the petals are distinct and usually crumpled. 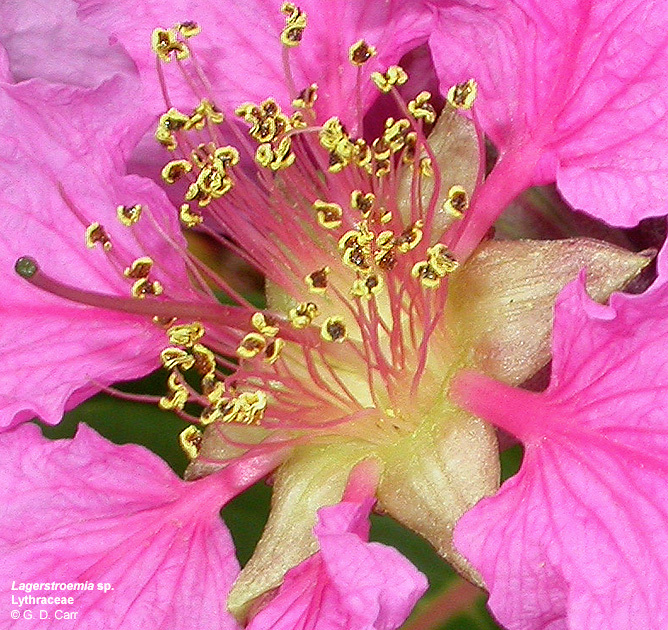 The stamens commonly are twice the number of petals, and are usually in two whorls, one with the filaments longer than the other. 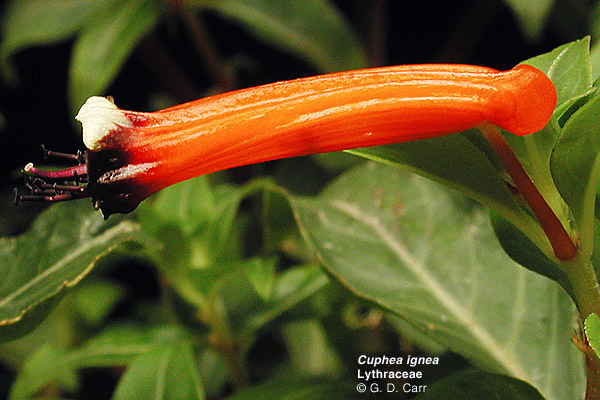 The gynoecium consists of a single compound pistil of usually 2-4 carpels, a single style and stigma, and a superior ovary with usually 2-4 locules, each with numerous axile ovules. 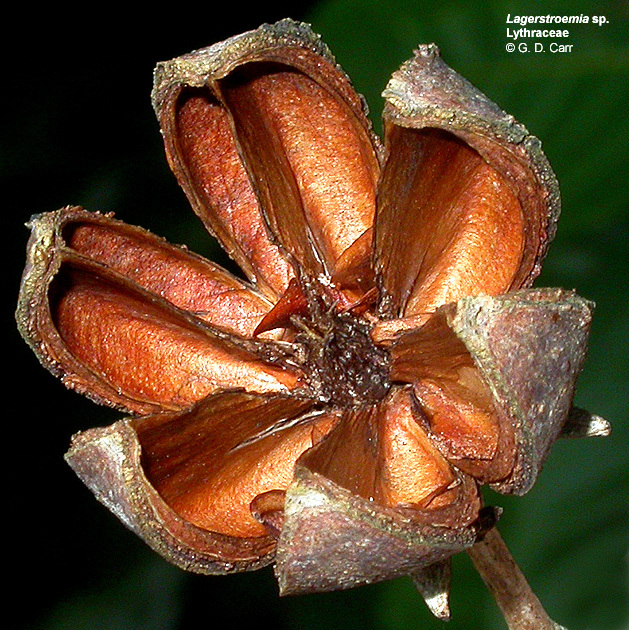 The fruit is commonly capsular. 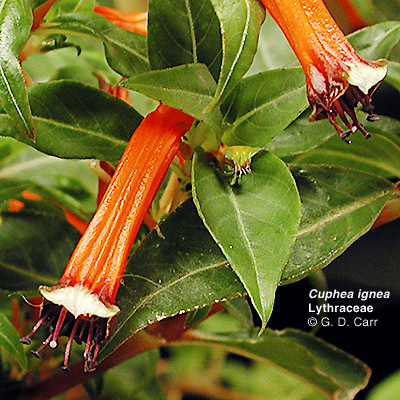 Cuphea hyssopifolium. 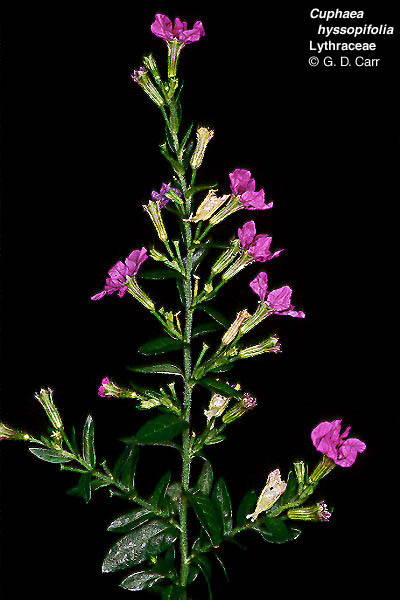 Note insertion of petals near summit of perigynous zone. 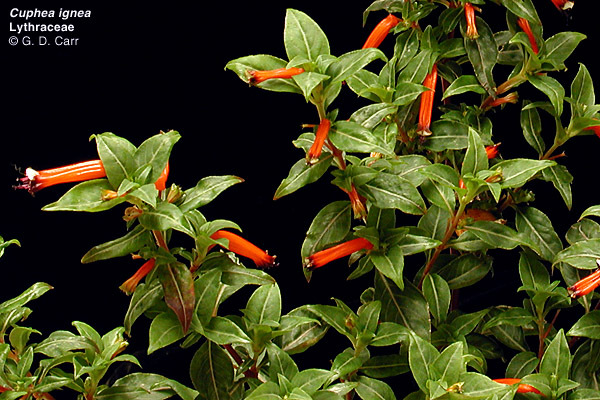 Cuphea ignea, cigar flower. Note bilateral symmetry and the exceptional lack of corolla in this species. 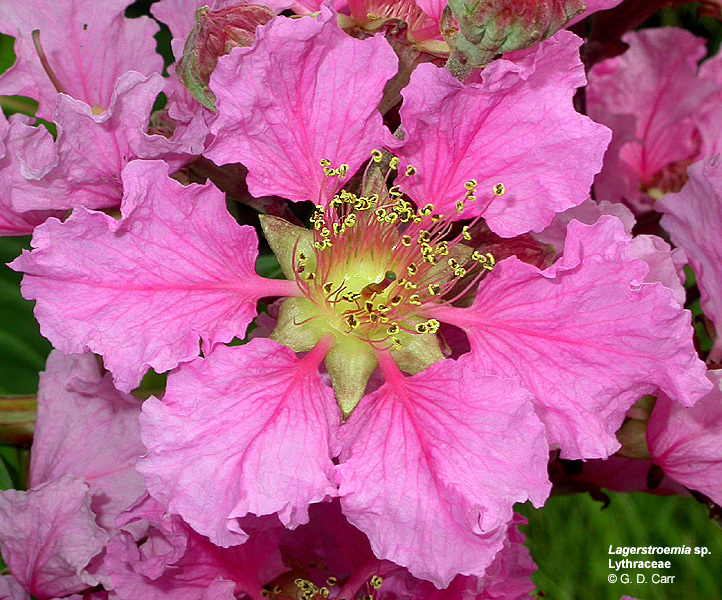 Lagerstroemia sp., crepe myrtle. 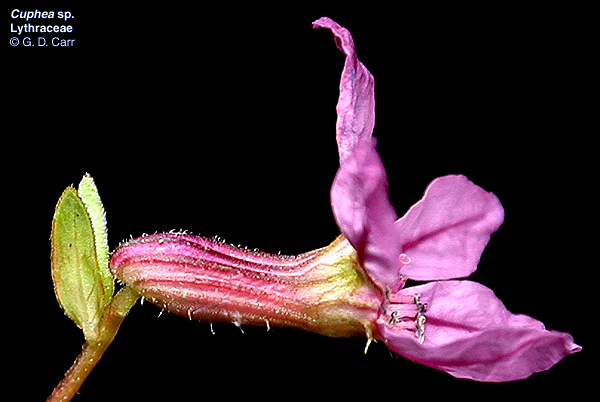 Note crumpled petals and the exceptional condition of numerous stamens. Good example of a loculicidal capsule. 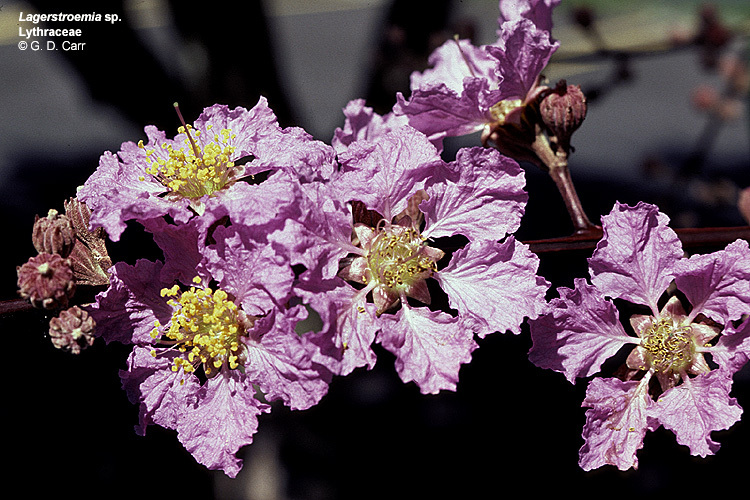 Lagerstroemia sp., crepe myrtle. 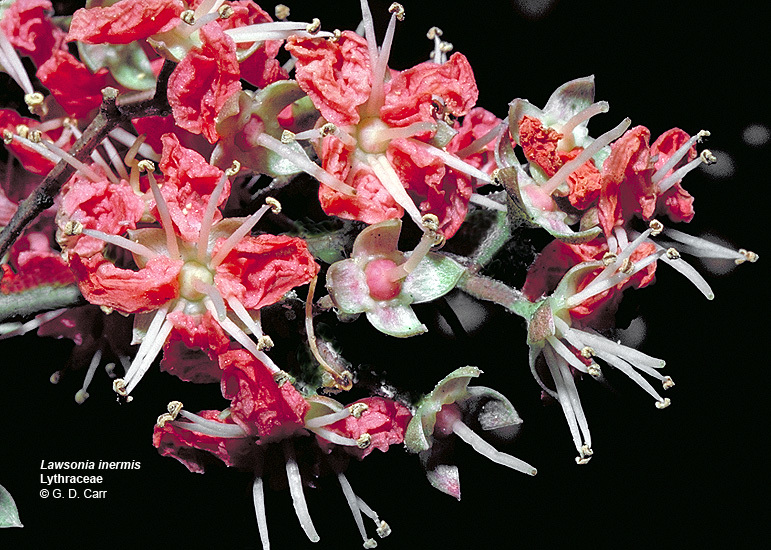 Note crumpled petals and the exceptional condition of numerous stamens. 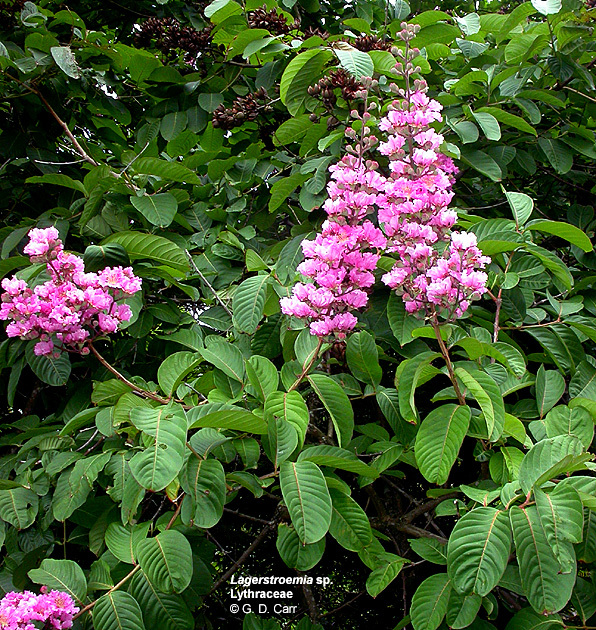 Lawsonia inermis, henna. 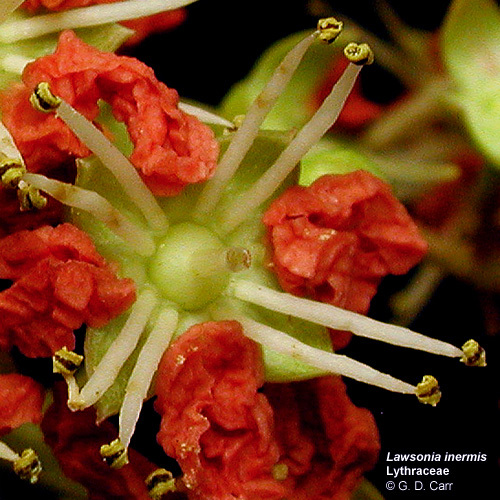 Note 4 crumpled petals and 8 stamens. 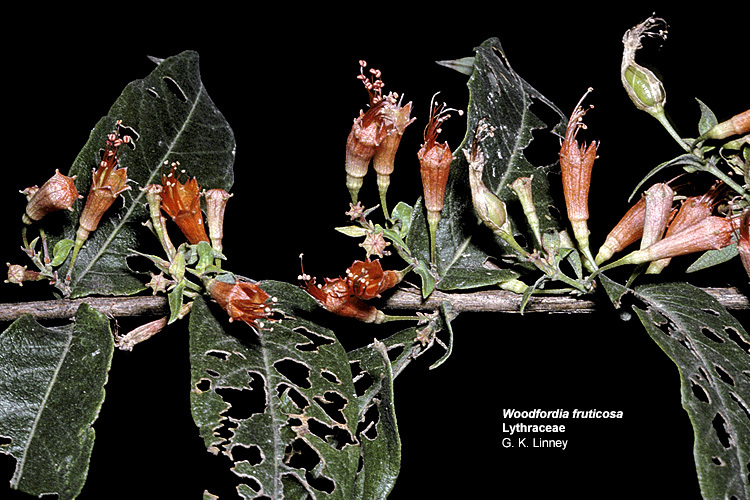 Woodfordia fruticosa. 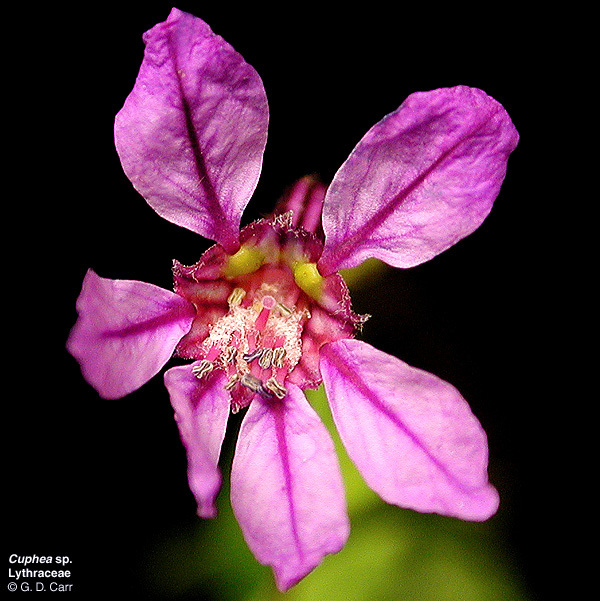 Note bilateral symmetry in this instance.